WBSSC Krishi Prayukti Sahayak Recruitment 2016 – Apply Online for 1204 Krishi Prayukti Sahayak Vacancies: Looking for WBSSC Recruitment? West Bengal Staff Selection Commission (WBSSC) has issued a recruitment notification for the recruitment of Krishi Prayukti Sahayak posts. Online applications are invited for filling up 1204 Krishi Prayukti Sahayak vacancies. Age Limit: Candidates upper age limit should be between 18 years to 40 years as on 01-01-2016. Age relaxation will be applicable as per rules. Educational Qualification: Candidates should have passed Higher Secondary/ 10+2 or its equivalent qualification for Krishi Prayukti Sahayak posts in West Bengal. Application Fee: General/ OBC candidates are required to pay application fee while SC/ ST and other reserved category candidates are exempted from paying application fee. Application fee will be available at Tathya Mitra Kendra, Where candidates can deposit Application fee. 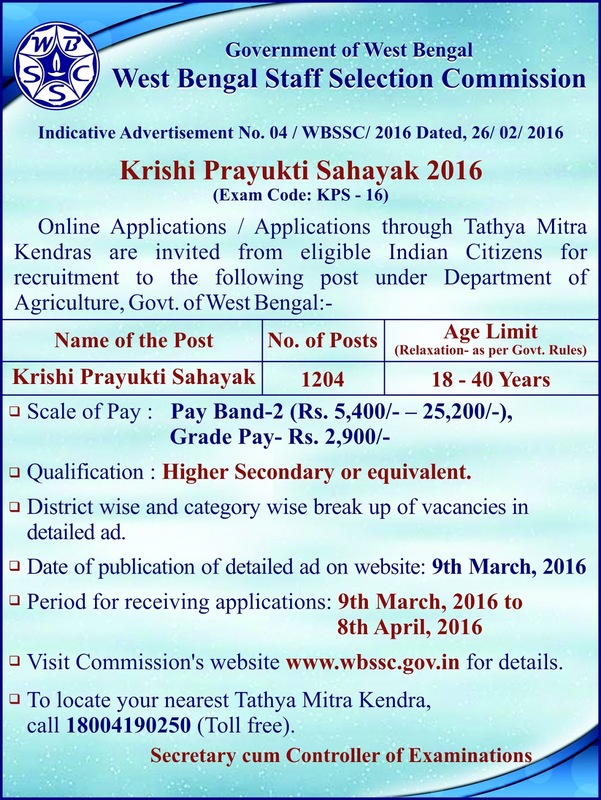 How to Apply Online: Eligible candidates those who wish to Apply Online for Krishi Prayukti Sahayak posts in West Bengal through Staff Selection Commission (WBSSC), they are required to apply through online mode on its official website at www.wbssc.gov.in from 8th March to 8th April 2016. Log on to official website at www.wbssc.gov.in. Now click on “Apply Online for Krishi Prayukti Sahayak” link. More Details: If you want more information about WBSSC Krishi Prayukti Sahayak recruitment, read official notification followed by the link given below. Online Application will be available from 09-03-2016.